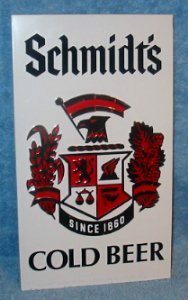 Schmidts Cold Beer; 5 1/2 x 9 1/2 inch, embossed heavy plastic sign with 2-sided tape on the back. Appears to be 1972 vintage. Great shape.